Whenever I find a new grain or lentil (new to me anyway) in a bulk bin, I feel the need to bring it home, look it up on line and give it a go. Kamut is an ancient grain that’s VERY chewy. It’s similar to wheat berries which would work just fine in this salad and is probably easier to find. The first go around with kamut I boiled it like barley for well over an hour which seemed like a long time, but our jaws were so tired from chewing and chewing and chewing. The next time around I found the key: cook on low for 2 hours, be sure to set the timer so you don’t forget about it. It still was chewy, but much nicer. The chewiness is the part I really like about this salad. Plan ahead because this salad really needs an over-night in the fridge for the flavors to shine! Once combined, add dressing to salad – stir it up and let it sit in the fridge over-night for optimal flavor. This looks great! I love the idea of having to chew a lot. I’m trying to diet and the hardest part is keeping my mouth happy chewing on something, which, all too frequently, causes too much food intake! Chew, chew chewing is right up my alley!!! Thank you!!! Well, I had to check out what “Kamut” was – and now that it seems to be similar to a wheat berry – will be on the lookoout. Even if it is chewy – chewing must burn calories! And it certainly looks flavorfu;l! I’ve not heard of kamut…wonder if it would be good in a granola bar because of its chewiness? Beautiful photography and colors in the images. Gorgeous photography. Don’t know that I’d be able to eat the grain, but it looks very healthy! I love trying new grains as well. I may have to grab a bag of this from my local bulk bin and try it as well. Thanks for sharing! I love chewy and crunchy salads. 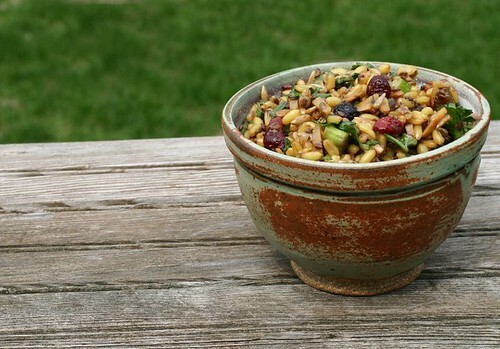 I have a wheat berry salad recipe that is similar, but I will give this one a try next time. Looks yummy! we actually stumbled upon some kamut at whole foods last week and i’ve been contemplating what to do with it all week. i’ll have to put your advice to use and try it this week! My host dad in France has been extolling the virtues of kamut for years and I still haven’t tried it yet – shame on me! Your salad looks really interesting and might just be the nudge I needed. And I love that first photo with the hand – very nice! I’ve always loved whole grains, all kinds. And just like with dry beans, it’s very worth taking the time to cook them slowly and for however long they need. I love your recipe – fresh, healthy and super-flavorful. Great post! I can never resist any salad with dried fruit in. It simply adds that kick to the salad. It’s always amazing to discover yet another new food. Thanks. This is a must try! What a healthy salad! Definitely a must try 😛 I love Kamut! Hi Mary, your salad looks marvelous, so colorful! I have no clue as to what Kamut might taste like as I never had wheat berries either. You have sparked my interest. I’ve never heard of kamut but your pictures make it look positively delicious! This also looks really good. I love grains. I haven’t had this in awhile and it is an interesting salad idea. Thanks doemthe inspiration. love the combination. 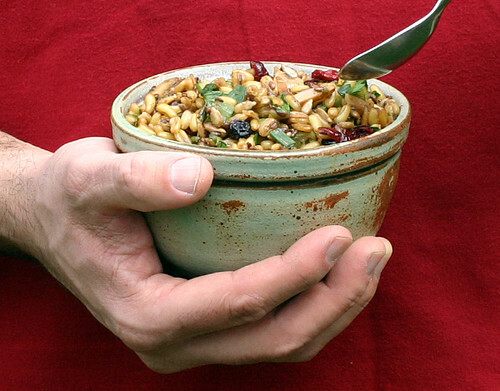 always looking for more wheatberry, kamut and spelt-like grain salads. will definitely give this a try. must try this new way of kamut! thanks for the tips!